Beaumont Hospital will get a new emergency department. 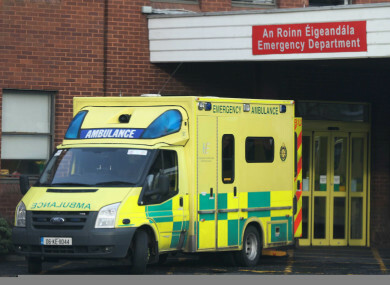 THE PROJECT IRELAND 2040 has pledged almost €11 billion to improve Ireland’s health system. The money will all go towards capital projects aimed at increasing capacity and services in the health sector. The plan prioritises a number of major building projects, beginning with the completion of the National Children’s Hospital and National Maternity Hospital, as well as new outpatient units at Connolly Hospital in Blanchardstown and Tallaght Hospital. The plan also includes a new acute hospital for Cork, but does not expand on the location or cost. There is also the promise of 2,600 extra acute hospital beds and three new dedicated elective-only hospitals in Dublin, Cork and Galway, which would focus on day- and out-patients in order to tackle waiting lists. “The aim is to both increase capacity in the hospital system and provide a better separation of scheduled and unscheduled care, in line with the recommendations of the Sláintecare Report. The plan also pledges 2,600 additional acute hospital beds to be delivered across all hospital groups and 4,500 additional long term and short term residential beds in community nursing homes in the public system. It has been welcomed by the Irish Nurses and Midwives Organisation, but the union sounded a note of caution that none of it can be realised without “significant measures to recruit and retain nurses and midwives”. Simon Nugent of the Private Hospitals Association said the plan “offers little solace to the hundreds of thousands of people currently languishing on public waiting lists”. Sinn Féin health spokesperson Louise O’Reilly accused the government of repackaging old announcements. “Two of the headline announcements were the National Children’s Hospital and the National Maternity Hospital, despite these being announced years ago. “A new endoscopy suite was announced for Naas General Hospital. While this is welcome I do hope it fares better than the surgery theatre there that has not been used once in 15 years because they don’t have the staff to run it, even though nearly 7,000 people are on waiting lists there. Email “'They'd have announced a new hinge on a door': Not everyone is impressed with the €11 billion plan for health”. Feedback on “'They'd have announced a new hinge on a door': Not everyone is impressed with the €11 billion plan for health”.